In the struggle of the polar forces of nature, Mars comes as a male complement to Venus. 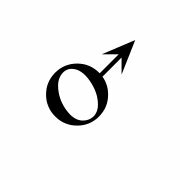 Its symbol is not accidently the opposite of the one of the female planet. Contrary to Venus, the cross of matter stands now above the circle of spirituality, so the spirit subordinates to matter. Matter does not obey the commands of the free will, but it is so strong that it has its own will; it even sometimes goes against our own real interest. It’s when anger overcomes self-control and we break up relationships and cooperations which are in our interest. Generally speaking, Mars symbolizes the need to claim what we want in an assertive or sometimes even aggressive way. It also shows how we face challenges and how we manifest our defense. It's the way we manage to survive offences, or the power that drives us to overcome resistance. It is action, assertive expression and manifestation of passion. It symbolizes our sexual energy and the drive for competition and success. If we try to suppress this instinct, this may result in an outburst of repressed resentment. Thus, Mars has to be respected and not considered simply malefic. From another point of view, Mars can also help finding new forms of self-expression. It symbolizes new beginnings, uniqueness and entrepreneurship. It is connected to new initiatives, bold schemes and foundation of courses. Starting an enterprise or a venture could be favoured by a well-positioned Mars. It is also connected to field management, or leadership in battle. Could be a general leading his soldiers, but also a decisive sergeant. In corporations, Mars could be the team manager inspiring or leading the team. In any case, it would have to do with quick and bold decisions, and it would require to sometimes making tough calls. As a person or a profession Mars can be a policeman, a paramedic, a young man, a firefighter, an ambulance driver, an acrobat (though he may have also been influenced by artistic planets), an athlete, an engineer or a worker dealing with machines. As a location Mars is associated with areas involving mechanical activities, workshops, construction, factories, as well as areas of military activity or activity of security forces. In mundane astrology Mars rules the security forces and the emergency corps. Psychologically Mars is the polar opposite of Venus. If Venus represents majority, Mars is the minority. It is the person who stands up against the group and tries to impose himself. The more you resist, the more the majority requires compliance. Mars' behavior seems rebellious and destructive, but it’s actually necessary, because it initiates the process of self-consciousness for the individual. With Mars, the filters of conventional behavior, which participation in a group creates, are expelled and we are forced to look beneath the veil of others for their true nature and the one of ourselves. In that sense, Mars gives us a first impulse to search for our psychic core. Positive qualities: courage, boldness, initiative, leadership, fighting spirit, dedication to work, assertiveness, action, willpower, motivation, crisis preparedness, willingness to lead, a trend for sport, self-confidence, survivability, claim fair. Negative qualities: impulsivity, uncontrolled passion, audacity, violence, aggression, disagreement, wound on the body, impatience, resentment, destructiveness, irritability, tension, jealousy, risk, danger, fire, dish, selfish claim, accident, disease, anger, challenge, competitiveness, pressure.